We live in a temperate area that is rarely cold enough for long enough that we can ice skate outside. 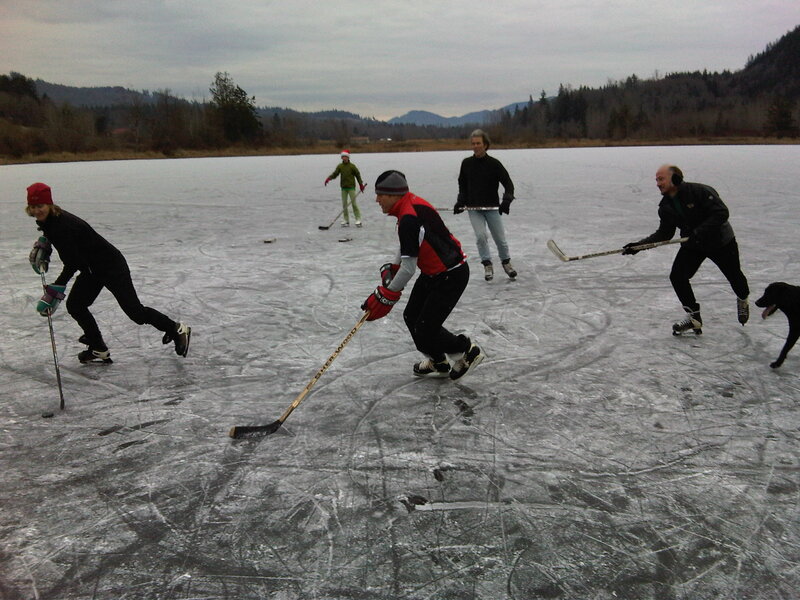 And we are part of a group of adults united over many years of playing league ice hockey at the local rink. This means that there are some among us, who, when the weather conditions start aligning, look for outside ice. If found, the phone calls go out, and people meet for a few glorious hours, maybe even over a few glorious days. That situation happened just this weekend, and my husband and I have blisters from so much ice skating. One child went with us, skated for hours, and wanted to go back the next day. The other elected to stay home. Not a full-on family adventure this time, but a chance for the adults to play like children and the children to have choices. Joy for all of us. If you want to get your family outside, many times you have to wean yourselves away from the tv, computer, and iPod. To this end, you might consider participating in your community’s Screen Free week or TV Turn Off week. Whatever it gets called and whichever week your community or your family designates, it’s a chance to think about how we spend our time, and take a break from all those screens. It was Dana’s idea for us our family to participate. No screen time at home, Monday through Friday, all week this week. She wants to go to the pool and the bookstore, her brother will bike or scooter with friends more after school I bet, and we parents will make sure to focus on family time. We get lots of that when we’re on bicycling, backpacking, and kayaking trips together, but sometimes not enough in the busyness of everyday life. I hope we go for a family hike and solidify our summer trip plans this week. I think we’ll feel like we have more time and be outside more too. We don’t have tv, but there’s often someone at the family computer in the kitchen. Even we need to move more and watch less. Family adventure requires some level of fitness, and kids getting fit with their friends is more fun for everyone. The weekend nearest St. Patrick’s Day, that puts us at the Runnin’ O’ The Green, a local race with 2-mile and 5-mile options. In the beginning, we went because dad/husband plays drums in the Celtic-rock band Maggie’s Fury, and the group plays pre- and post-race. But for the last three years, the kids have run the 2-mile race. They like dressing up in crazy green outfits, don’t seem to mind that it rains most years, and after they finish, they cheer in their friends, which is darn heartwarming to see. Then while everyone waits for results, the kids dance to Maggie’s Fury songs. The whole event is good green fitness fun. I’m proud of the participants and those of us who only cheer. Yep, I get my fitness in bicycling around town, but I sure can appreciate those runners.